For those who procreate and yet still insist on feeding their wanderlust, many baby travel products promise to make adventure a breeze. 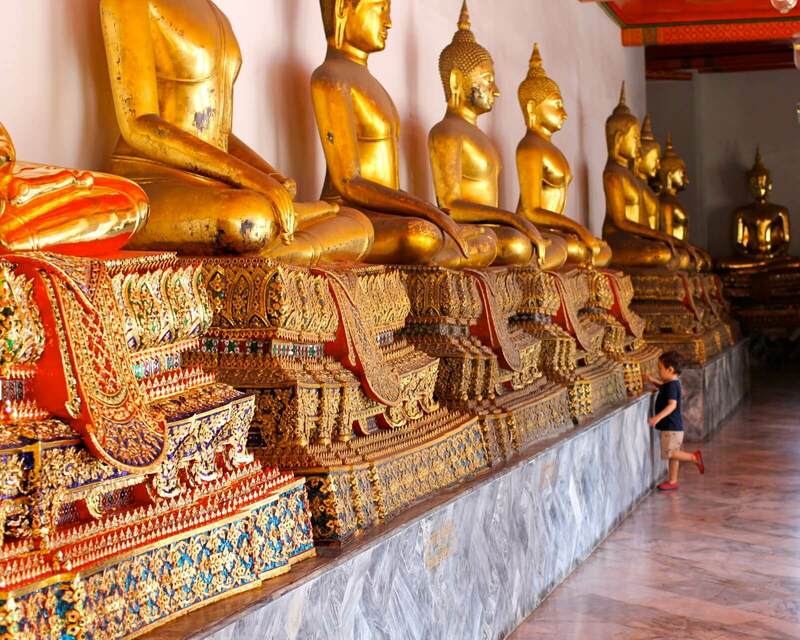 Below is a rundown of a few I’ve found helpful in our travels around Asia. 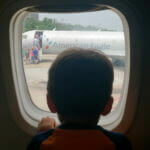 For another perspective, also see NewsMom Julie Watts’ 10 Must-Haves for Travel with Toddlers. The first rule of flying, in my book, is that “screen time” limits stay on the tarmac. If my kid will watch something—anything—on a flight, I’m relieved. 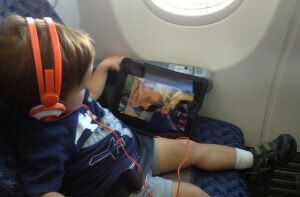 An iPad with pre-loaded episodes of his favorite shows is helpful for this, but the real winner is appropriate headphones. According to the Centers for Disease Control and Prevention, extended exposure to sound 85 decibels or higher can damage hearing, so most headphones targeting young children limit sound to this level. Here’s a helpful review of various options on the market. Also, since the drone of less-than-white noise in an airplane cabin tends to hover around the 85 decibel mark with spikes of up to 105 decibels at takeoff and landing, the noise-canceling aspect of such headphones is another reason to invest in a set. If you travel outside the United States—or even to friends’ houses—a highchair or booster might not be available. Rather than wrestling with your child on a booth bench or MacGyver-ing your baby carrier to strap your kid to a chair (ahem, yes, I’ve done this), try a travel booster. I own the Brica version, but it seems many more, possibly better, options are available now. The downside of the Brica is that as it wears out, it starts collapsing a bit if the child leans forward. This hasn’t been a huge problem for us… yet. But the essential feature of a travel booster is that it folds to easily fit in a backpack or diaper bag and can keep your baby or toddler safely attached to a chair so you can eat without a lap child. …And a good attitude about hotel hangouts. Kids need downtime, and hotel rooms are also an adventure when you’re 3 years old, or 10 months old. 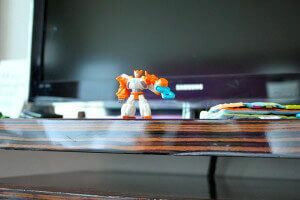 Small toys can help focus your kids away from the phone cords and vodka-stocked mini fridge. Is that an oxymoron? If you have multiple young children and one tends to wear out after a long, adventurous walk, a sit-and-stand stroller could be a life saver. These may be common in the United States, but we’ve had many parents abroad ooh and aah over our Joovy, and one Thai mom in Bangkok stopped us to ask where she could buy such a wonder. Any stroller, single or double, is annoying to carry up a set of stairs in countries where accessibility is not the priority, but overall, ours has been wonderfully helpful. This seems basic, and it is, but it is also SO. ESSENTIAL. If you have a baby, he will need to nap. And he will need to get around, even when a stroller is not possible (or when exhausted big brother begs for the front seat). Find something that doesn’t destroy your spine or your posture, and go for it. Generally, I’m a waste-not-want-not kind of mom, but when I’m traveling, I don’t particularly want to wash a silicone placemat in a hotel sink, let alone carry a dirty one in my bag, which is already heavy with diapers, food and other necessary travel gear. It took a little while to convince myself to buy disposable, stick-on placemats, but I’m so glad I did. Given, my little guy can easily pull it off if he gets the idea into his head, but I find I can stick it on right when I’m setting down his food and it’ll stay on until his hunger wanes. Similarly, disposable pocket bibs are a helpful travel stand-in for their amazing silicone counterparts. Again, they are easily pulled off, but if you time it right and don’t put a bib on while the child is impatiently waiting for food, you can make it work to your great advantage. In Asia, table napkins—if available at all—are typically tiny and boast the fortitude of off-brand Kleenex, so these have been a major win when out and about. Even better and less wasteful, a little gadget like this can turn a large paper napkin (rarely found in Asia) or a cloth hotel napkin into a bandana-style bib. It’s tiny but mighty, and you can even make your own version with binder clips and ribbon. #NewsMomReviews are written by journalists, not “brand ambassadors.” They are not endorsements (paid or otherwise). These reviews are simply anecdotes about real-life experiences with popular products, apps and services. Got a topic you’d like us to cover? Pitch it on Facebook or Twitter @NewsMomDotCom (and follow us while you're there! ).